State secrets, State and industrial espionage, spies, and spy-masters were popular staples of early 20th Century fiction. Pulp fiction, serial film cliff-hangars, comic strips and Radio programs of the era regaled millions of avid readers, viewers, and listeners with tales of secret, international derring-do. 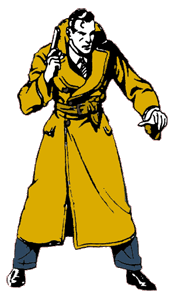 "Samuel Dashiell," Dashiell Hammett's syndicated nom de plume in newspapers of the 1930s, collaborated with King Features and famed illustrator, Alex Raymond, to introduce Hammett's 'Secret Agent X-9' character to comic strip fans in January 1934 [Robert Storm later took over the writing duties from Hammett). The serial spy films of the era were equally entertaining--and popular. Spies and spy-masters first entered the 20th Century lexicon during World War I, with the infamous "Mata Hari" taking a lion's share of notoriety during World War I and the following thirty years until the Second World War. North Americans' sharpened awareness of sabotage efforts on the homefront and abroad, as well as the effects of widespread propaganda, a resurgence of Black Market activities, and a renewed awareness of the often global effects of piracy, shipping lane sabotage, and international espionage were popular fictional fodder during the post-War era and the aftermath of the Great Depression. Packaged for a range of maturity levels, and with varying degrees of realism and mayhem, the spy dramas of Print, Film and Radio captured the imaginations of audiences throughout the world. The more ambitious or complicated spy adventures readily leant themselves to serial films and serial magazine installments of the era. As Radio continued to gain a foothold, serial Radio adventures presented yet another venue for the spy fiction of the era. 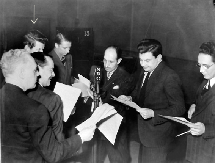 As hinted above, some of Radio's most enduring talents cut their teeth on the spy adventures of the era. The writing for spy adventures was also generally a cut above, owing primarily to the often convoluted detail and duplicitous complexities that necessarily comprised the better spy adventures. 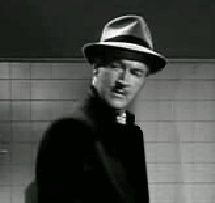 Secret Agent K-7 first appeared over Radio between 1932 and 1934 on NBC [WEAF] with George K. Zimmer as Secret Agent K-7. 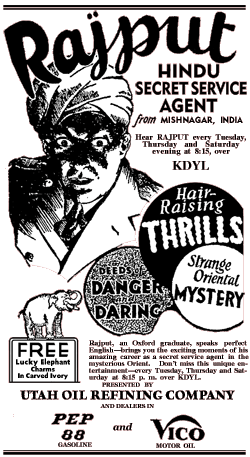 A series of Secret Agent K-7 serial films began screening during 1936-1938. Referred to in the print media of the era as either/both Secret Agent K-7 and/or Special Agent K-7, the serials were screened--and rescreened--over a period of almost 20 years, often broadcast over the earliest years of the Golden Age of Television. 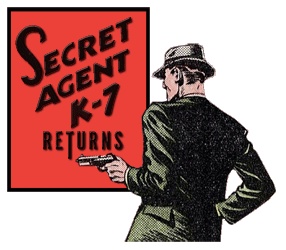 Secret Agent K-7 Returns first began airing during the Fall of 1939. 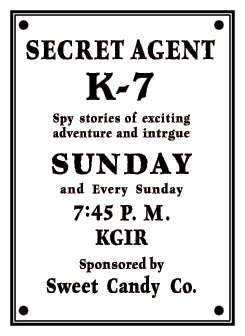 A syndicated, transcribed production, Secret Agent K-7 Returns was first heard over at least two major networks as well as numerous regional Radio outlets throughout North America. 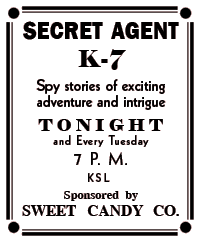 In this rendition of the exploits of Secret Agent K-7, the series is portrayed and introduced as the memoirs and reflections of the, by then retired, Secret Agent K-7 himself. Secret Agent K-7's years in service covered exploits on land, sea and air in twenty-two countries. Secret Agent K-7 frames his past adventures during the prologue of each installment, framing sufficient exposition to allowed the dramatized exploit to stand on its own during each installment. 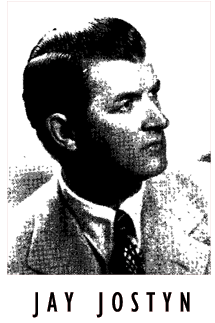 Host John Holbrook would generally introduce Secret Agent K-7 himself, who would then frame the particular adventure to follow by way of stressing a 'growing international threat' itself, and only then, by way of illustrating the night's threat, introducing one of his Special Agents--or their antogonist(s)--and the exploit of the evening. The Special Agent chosen for that night's tale would then pick up with that installment's script. The series of approximately 78 installments covered all manner of traditional, newly emerging and potential future espionage and reactionary threats throughout the world of the late 1930s. We remain unsure as to the identity(ies) of the advisors or consultants for the syndicated series, but many of their suggested threats--and underlying hypothetical details--were remarkably prescient, given the events that would transpire less than twenty years after the last installment of Secret Agent K-7 Returns was recorded. It's tempting to suggest that Phillips H. Lord may have played some role in either the production or scripts but we have no historical basis for that supposition. The series certainly smacked of Lord's touch. Even more of a tribute to the production, presumably recorded during the 1938 to 1939 timeframe, after the outbreak of World War II and in the aftermath of the attack on Pearl Harbor, Secret Agent K-7 Returns returned to the air over at least CBS from 1942, forward. The renewed appeal of the series almost certainly owed itself to the fifth column, espionage and sabotage activities being reported throughout the contemporary War News stories of the early 1940s. Network(s): CBS, CBS [Pennsylvania], and other local affiliates and networks while in syndication. For as long as we can ascertain, most catalogers who've attempted to log Secret Agent K-7 Returns seem to be under the impression that famous Stage and Screen star Walter Pidgeon regularly appeared as "Secret Agent 'Z'" throughout the canon. As with most of this persistent OTR lore, we have no idea where this misrepresentation started or why it continues to be so stubbornly perpetuated. Clearly whoever started that rubbish--and those who perpetuate it--think we're all just pigeons, ripe for the plucking. 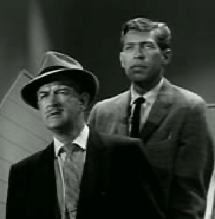 The actual actor performing the role of Secret Agent 'Z' was almost certainly veteran character actor Jay Jostyn of Mr. District Attorney fame, among hundreds of his other roles in both Radio and Television. 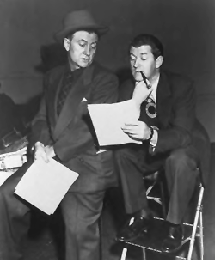 Both Jay Jostyn and Walter Pidgeon were possessed of remarkably distinctive voices, but their respective voices bore no resemblance whatsoever to each other. As a practical historic matter Walter Pidgeon, by 1939, had already appeared in forty-six films, many in significant supporting roles. By 1942, when the series was reprised, Pidgeon had starred as Nick Carter in Nick Carter, Detective (1939), Phantom Raiders (1940), and Sky Murder (1940); and in breakout roles in How Green Was My Valley (1941) and Mrs. Miniver (1942). Either the promoters and publicists for Secret Agent K-Returns were as thick as bricks, or guilty of malpractice, or . . . Walter Pidgeon never ever appeared in the juvenile adventure series Secret Agent K-7 Returns, Q.E.D. As will become readily apparent in the log below, there were no cited titles, nor appearances of a particular 'Secret Agent' nor synopses among the many newspaper Radio Listings we employed in cataloging the canon--let alone even the remotest reference to Walter Pidgeon. The overwhelming number of circulating script titles bear no resemblance to the actual script(s) they represent. It's apparent that the titles either came from some of the earliest, hand-annotated transcriptions or tapes in collectors' hands or they were created out of whole cloth by merely listening to the first two minutes of a given transcription. The fallacy in that unfortunate practice is that, while Secret Agent K-7 usually addressed an espionage concern of the era in his introductory prologues, the 'keywords' or 'phrases' he employed in those remarks rarely reflected the actual subject of that evening's script. And of course, most of the various experts who've created logs of Secret Agent K-7 Returns in the interim, clearly 'borrowed' all of those inaccurate titles from each other to perpetuate them in their 'own' logs--including the specious Walter Pidgeon credit. In the final analysis, given the over-the-top lore about Walter Pidgeon starring in the series, the veracity of everything else that's ever been written or logged about the canon comes into question--for us, anyway. We simply report what we find or hear. It's up to the visitor to decide what he or she chooses to perpetuate about this series. Sadly, the hobby continues to be so top heavy with 'experts' that correcting long-standing inaccuracies like those in the currently circulating logs of Secret Agent K-7 Returns are, for all intents, doomed to failure. As a consequence of all of the above, the log below contributes little more than more accurate titles, the 'Special Agent' assigned to a particular script, and a regrettably sketchy log of less than half of the original run. As such it will have to remain a work in progress for the forseeable future. As with everything we research and log, we present the data on this page as a point of departure for any more accurate logs to follow. The circulating logs are demonstrably either wholly or partially fabricated, serving no real purpose to anyone but a CD or MP3 reseller--certainly not to their customers, as is usually the case with commercial OTR. Though virtually all loggers cite as many as sixty-nine circulating exemplars of Secret Agent K-7 Returns, a closer examination of almost anyone's holdings will almost certainly reveal between three to five complete duplicates, simply passed off as unique exemplars from the canon by merely changing the circulating title. This should come as no surprise to anyone, given the proliferation of that practice throughout OTR. Jostyn was voted 'handsomest actor in radio' by the students of Hunter College an all-girl college. Actor Jay Jostyn's career seemed inexorably connected to some sort of legal tether for almost his entire career in Radio, Television and Film. 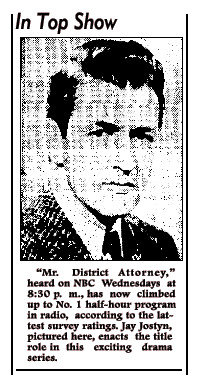 For almost five years, the title role of the NBC dramatic show, "Mr. District Attorney," fell each week into the capable hands of Jay Jostyn, a, by then, well-known radio player. Jostyn, a handsome Milwaukee lad, was a product of Marquette University and the University of Wisconsin Dramatic School. He made his professional debut in his home town at 19, then took his turn at stock and landed in radio in 1936, while on the West Coast. 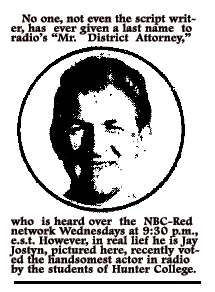 As Mr. D. A., Jostyn was heard every Wednesday at 8:30 p. m., EST, over the NBC-Red network. Jay Jostyn, who married Ruth Hill, an Emporia woman with a great deal of acting ability, has been a member of Blanche Yurka's Summer School of the Theater in Carmel, N. Y., serving as a teacher. Mr. Jostyn is head of the radio department of the school and will intruct students in a professional understanding of the technique of the air. Mrs. Jostyn is a niece of Jay Robinson and Alice B. Robinson of Emporia. "Radio actor Jay Jostyn once appeared in 35 script shows in one week, portraying 45 different characters." Canned: Police of Manhasset, L.I. rushed to a house in which neighbors the other afternoon heard sounds of a gun fight and struggle. The officers sirened their way to the front door, forced their way in and, to their amazement, found, instead of a raging battle, merely a peaceful family scene. It seems that Jay Jostyn and bis wife had been listening to a recording of the radio program in which Jostyn plays the title role and the neighbors had mistaken the canned revolver fire for the real thing. Manhasset <AP> An actor without a barber is practically an actor out of work, unless the actor is Jay Jostyn. For Jostyn cuts his own hair. Fifteen years ago he formed the habit when he was playing in stock companiesand couldn't get a barber to cut his hair the way he wanted it cut. Now Jostyn, a successful radio star, cuts the hair of both his sonsand occasionally that of his wife. If his neighbors in Manhasset, L.I., have anything to say about it, it will be Congressman Jay Jostyn after the coming elections. Jostyn known to millions of dialers as the "Mr. District Attorney" of the air (Wednesdays,' 9:30 p. m., EWT NBC), is being urged by friends in the district to run for Congress in November! If those were the same neighbors that almost turned him in a couple years earlier, we can perhaps infer that Manhasset was a gun-totin', gun-rights, Republican stronghold. As it turned out, Jostyn didn't take them up on their suggestion to run for Congress. 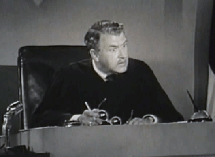 But he did re-enter the courtroom in 1958, this time as a sitting Judge: Judge Jay Jostyn of Night Court over local Television station KTLA, until it went national as Night Court U.S.A. In a Radio career spanning almost thirty years, Jay Jostyn compiled an impressive array of Radio credits, but it seems he'll be forever associated with his role as Mr. District Attorney. In Film and Television, Jostyn was also often cast as an attorney or judge of one era or another. To his great credit, he wasn't above parodying himself from time to time as well--in both Radio and Television. Jostyn's Television career was as busy as his Radio career had been. Though never again finding a starring vehicle after his stint on Night Court, Jay Joystyn remained very busy indeed for the remainder of his acting career in a wide array of solid supporting roles and guest appearances. One of Radio's more durable--and widely popular--radio stars, Jostyn succumbed to a reported heart ailment in 1976. He was survived by his wife of 48 yrs and their sons.